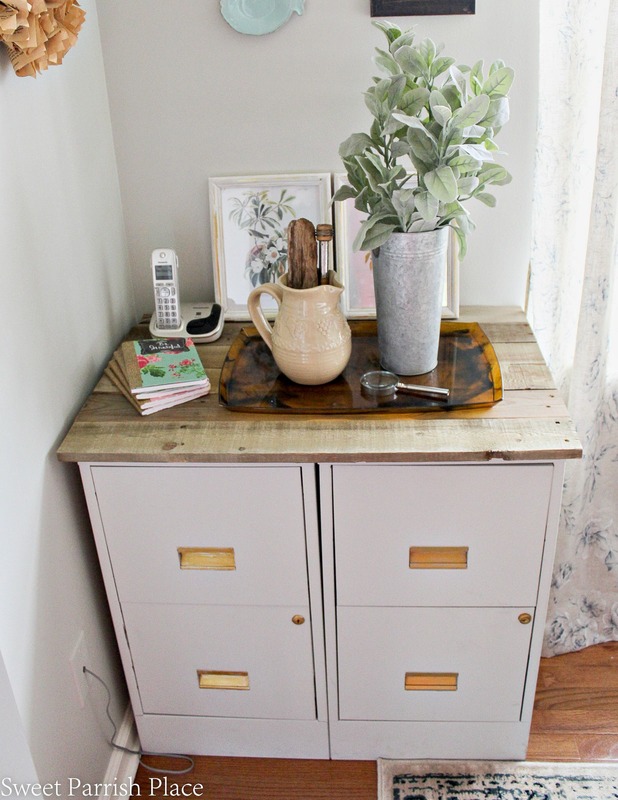 Trashtastic Treasures are my jam, and today I have a really fun and easy DIY file cabinet makeover with a rustic wood top and gold accents for you! Hey friends! 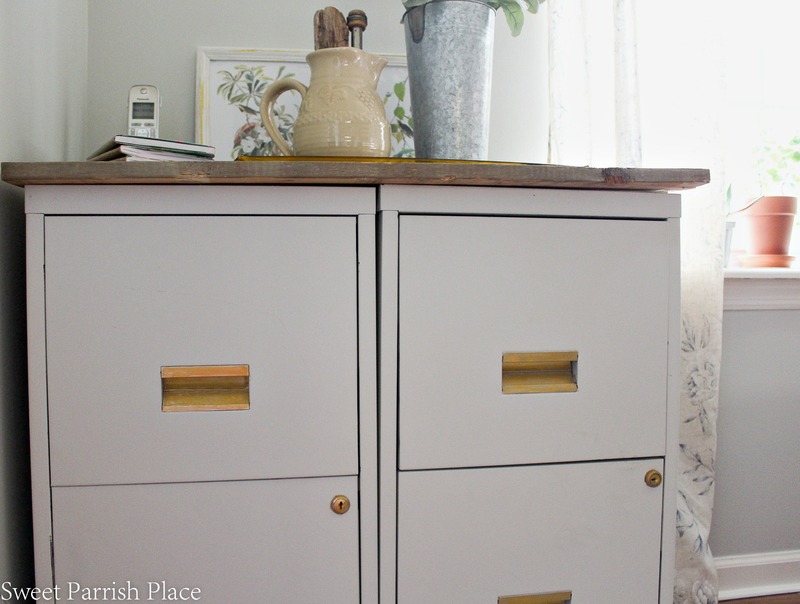 I’m back today for another Trashtastic Treasures, and today I have a DIY file cabinet makeover for you with a rustic wood top, and a pop of gold. 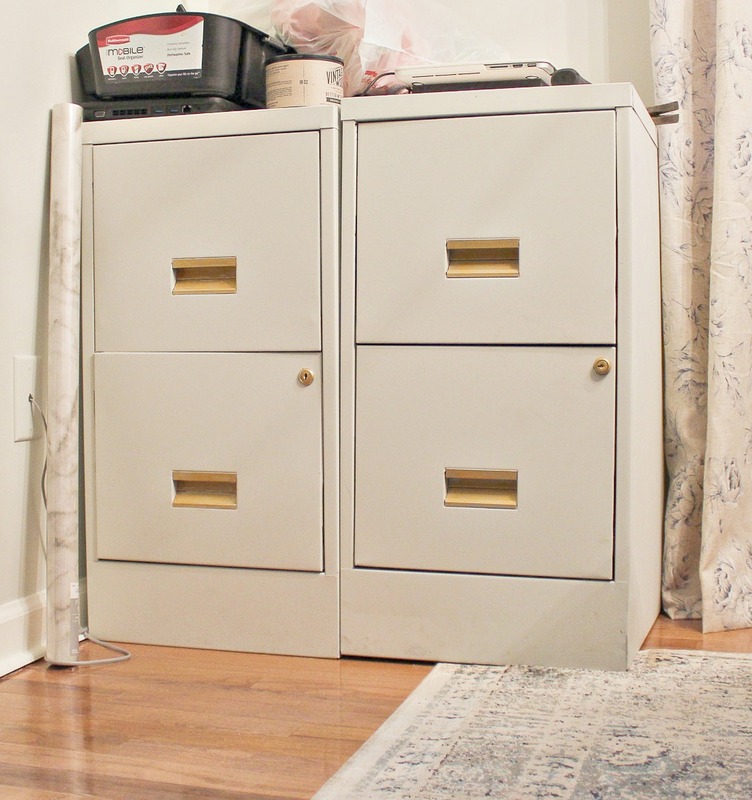 You might recall that I already wrote a post a couple of years ago and shared my first go around at making over these same two filing cabinets. The first time around I cleaned these thrift store finds and spray painted them. However, in that post, I mentioned that I was considering painting out the drawer pulls and adding a wooden top. And it took awhile, but I finally got around to doing just that! 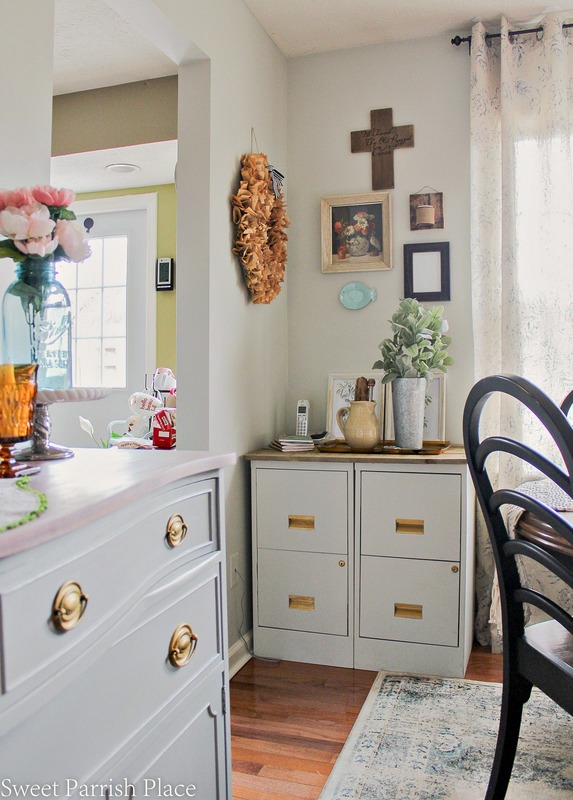 Take a look at where I started with these two cabinets. I paid $15 for these two cabinets at a thrift store. This was during the process of spray painting them using Gray Owl by Benjamin Moore. I painted them using my Homeright paint sprayer. You can read all about the process I went through here. They lived in my dining room/office like this for the next year and a half or so. They held up really well over that time period. They had a couple of tiny places around the front edges that had chipped, and I was able to touch those up with a brush using left over paint I still had. 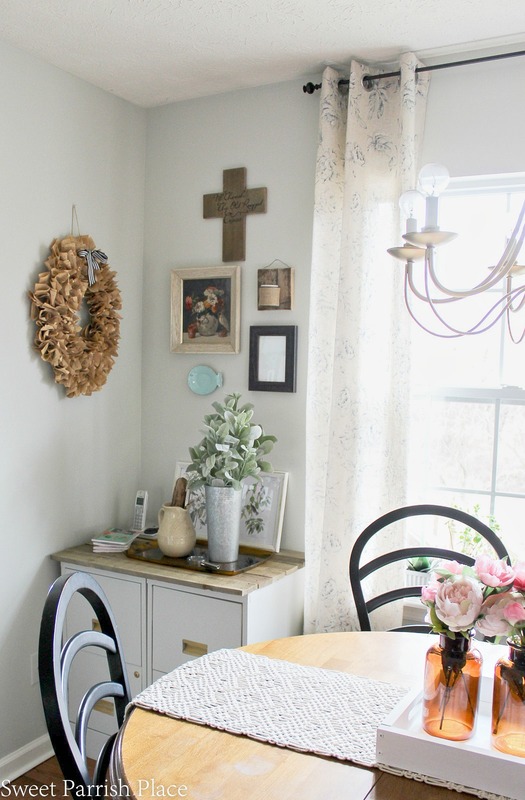 You may already know that earlier this past winter, I made over my dining room/office for the $100 Room Challenge. 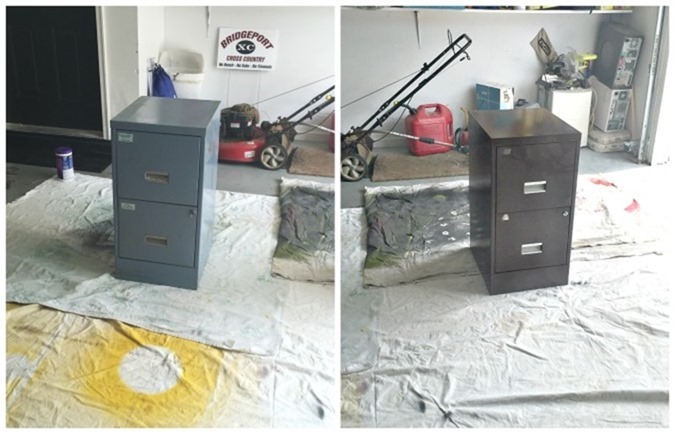 During that whole challenge, I decided it was time to dress these file cabinets up a little more. I actually hate that my dining room/office has to be a shared space, but I have no choice in this house. So I wanted to make these file cabinets look more like a piece of furniture, because I need to keep them in here for storage. So I decided to go ahead and paint the drawer pulls and the keyholes gold, and to add a rustic wood top to make the two cabinets look more like one piece, and more like a piece of furniture. And the best part of this project is that I completed it for free using items I already had on hand. These are the cabinets after I had painted the drawer pulls. 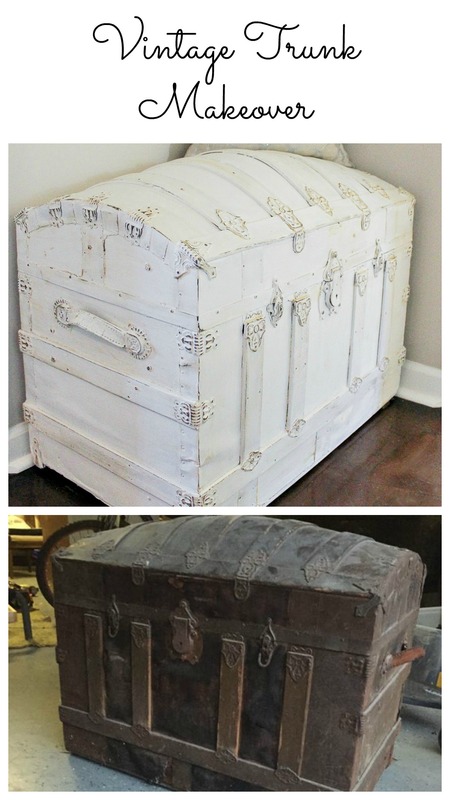 I used Rub n Buff in the color antique gold to paint these. I used a small artist paint brush, and painted the Rub n Buff on, then I buffed it with a clean soft cloth. Just doing that made the cabinets look a little more dressed up already. Next up was to add a rustic wood top across both of the cabinets. I used pallet wood for the top. I happened to have a pallet lying around just waiting for a project, so it was perfect for this one! 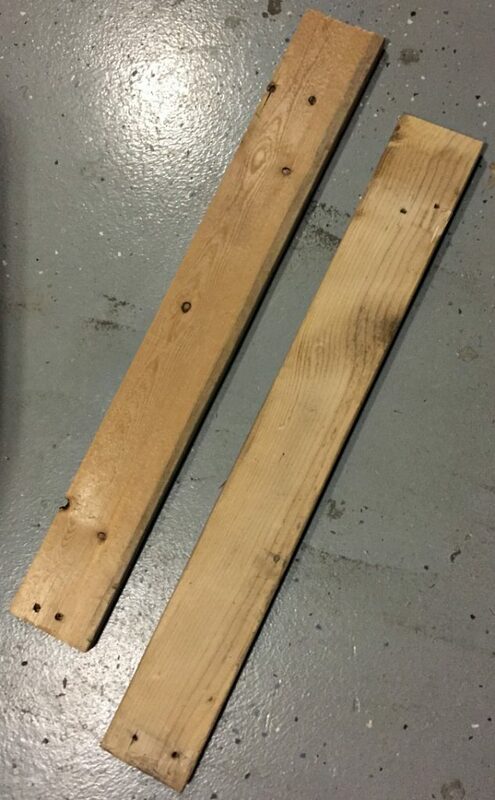 All I did was measure the width of the two filing cabinets side by side, and then I added two inches to that so that the pallet wood would be one inch longer on each side. I wanted the wood to be slightly wider and slightly longer than the width of the cabinets so that It would be larger and look like the top of a piece of furniture would look. I got lucky in the fact that 6 pieces of pallet wood was just what I needed to fit the top of the cabinets. So all I had to do was cut them to my desired length. I then used my miter saw to cut each piece of wood to the same length. Before I cut all six pieces of wood, I cut the first piece, and then laid it across the file cabinets to make sure I liked the length. Always check and double check when you are measuring and cutting. After my pieces of wood were the length I needed them to be, it was time to make them look weathered. The photo above is what they looked like in the beginning, before I gave them a weathered look. 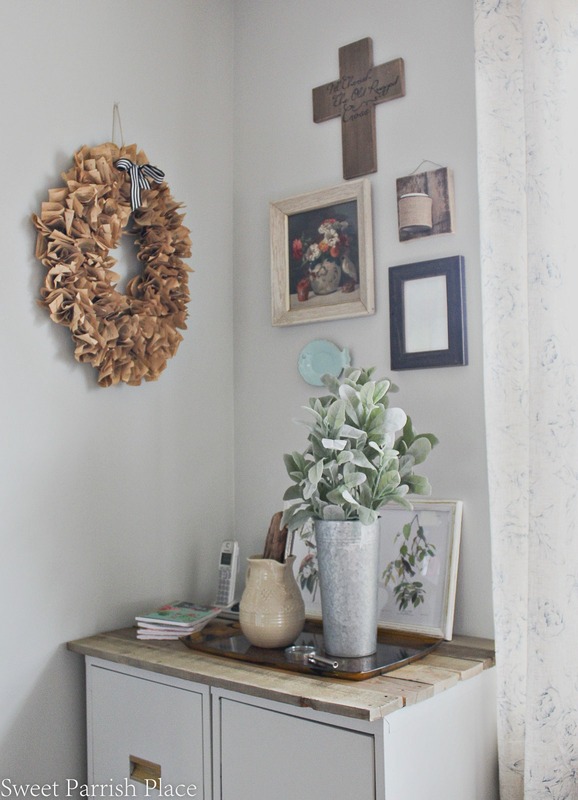 The product I used to get this look is by Amy Howard, and it is called Better With Age in the color salvaged timber. And let me tell you, this stuff is amazing! All you do is shake the can really well and paint it on using a paint brush. Then you just let it dry, and your wood looks instantly weathered! It really is amazing how well it makes new wood look aged. You might be wondering how I adhered the wood to the top of the filing cabinets, and the answer is, I didn’t. I did consider how I might do that, but then I started thinking, when it comes time that I want to move these cabinets, that having the wood attached would pose a problem. So I decided to just lay the pieces of wood across the cabinets and call it a day. And so far so good, it really hasn’t caused me a problem in the slightest. 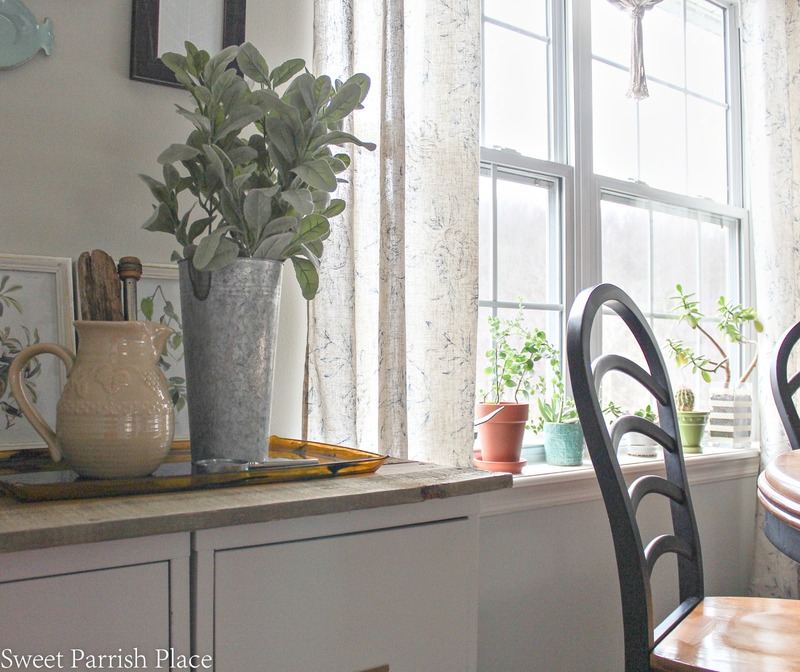 In these photos I’m sharing today, I have styled the cabinets for the big dining room/office reveal. But truth be told, a big honking printer usually sits atop these file cabinets. And it is heavy, so that wood isn’t going anywhere! But I couldn’t share a room reveal with a big honking printer sitting here, so I waited until after the reveal to put it back in place. But I enjoyed having it look pretty while it lasted. 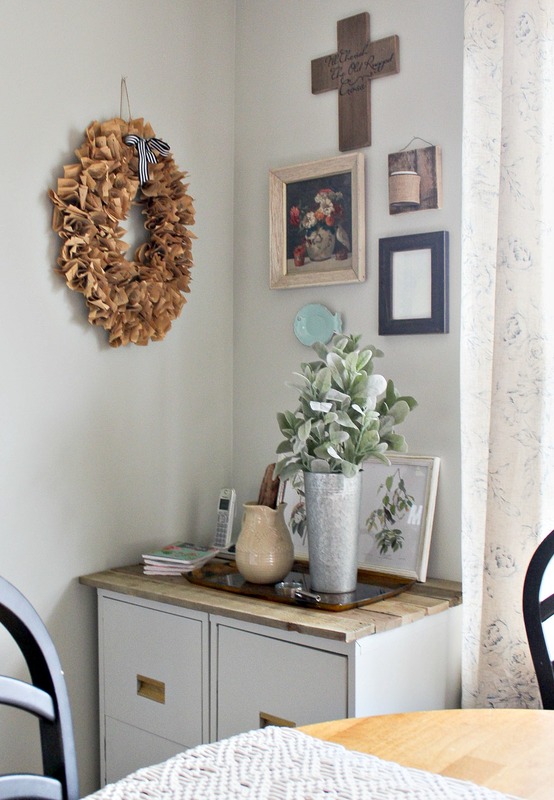 I hope you enjoyed my DIY file cabinet makeover today! 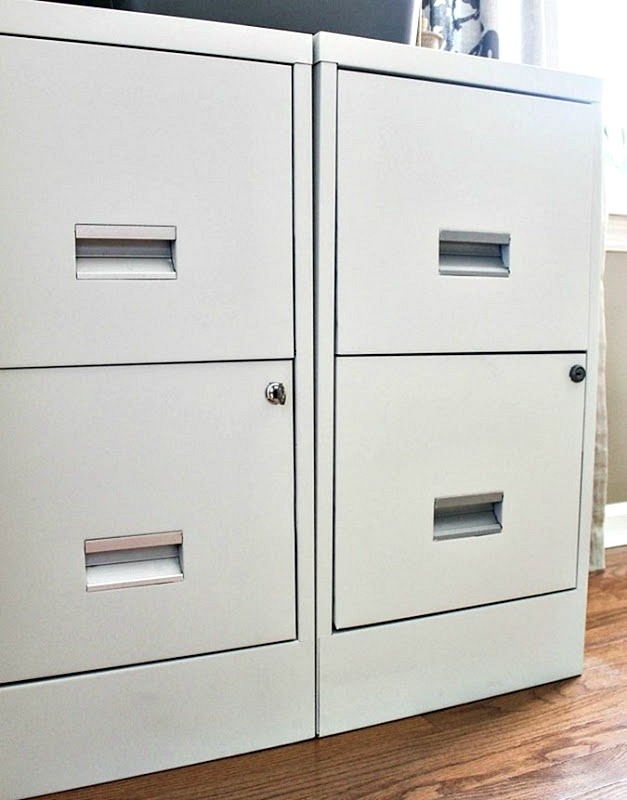 These file cabinets are very useful and necessary for us. We keep all of our important documents in one, one drawer holds my camera equipment, and one holds work supplies for my husband. My husband is a pharmaceutical rep, so he doesn’t have an office to report to. Therefore he needs somewhere to store some things. 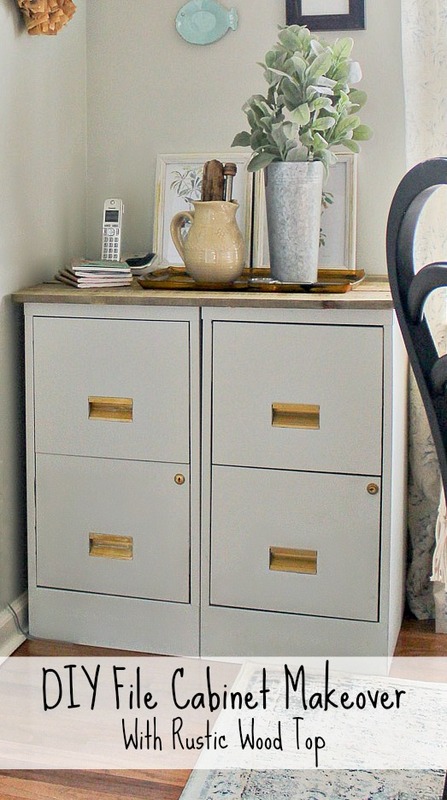 I am so much happier with the way my file cabinets look with the gold hardware and the rustic wood top! And it just so happens that we may be able to move our home office out of the dining room in the not so distant future. My 22 year old daughter is getting ready to move to Florida for a job she has accepted there, so we are discussing plans to make her bedroom into a guest room/office. That way we can have a home office, and she will still have a place to sleep when she comes home for visits. And then I can reclaim my dining room, which is exciting for me. (Although, I hate to see my daughter go, sniff sniff). Check out more of my Trashtastic Treasures series here! 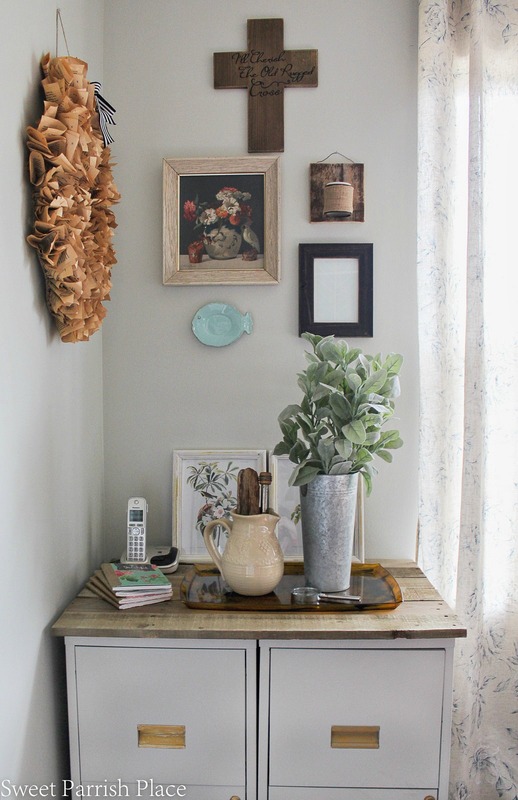 I have old desk lockers like yours and I did not know they could be great as a decorative storage cabinet. A touch of painting and it will be great. Thanks for the tip. 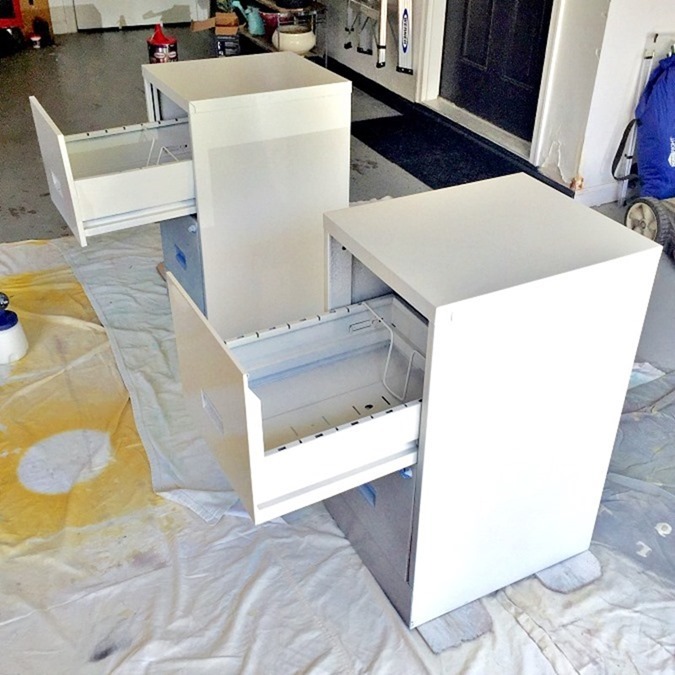 It’s amazing what you can do with a pair of ugly filing cabinets with a lick of paint and some wood. Great job! They look fab:) Thanks for sharing Nicki! 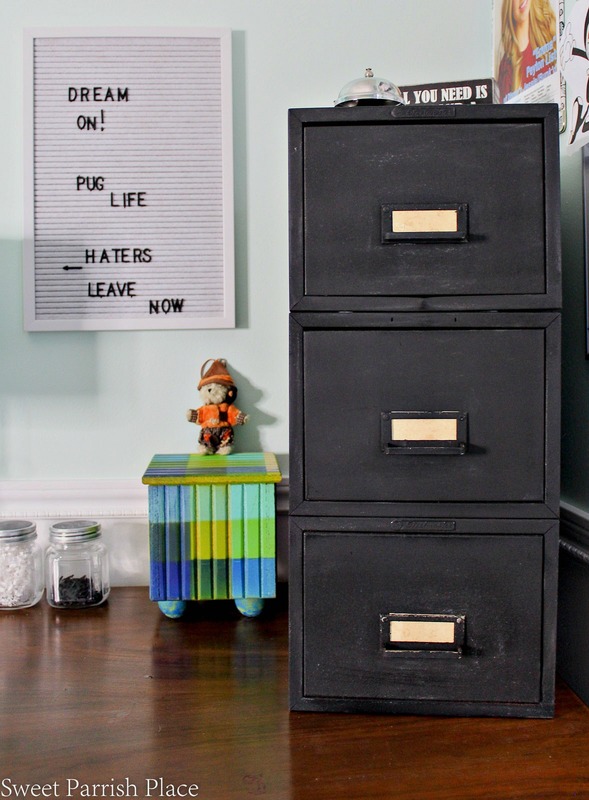 Its a lovely post about file cabinets I would like to share this post because its very helpful for me. Thanks for sharing such kind of nice information with us. Keep sharing. 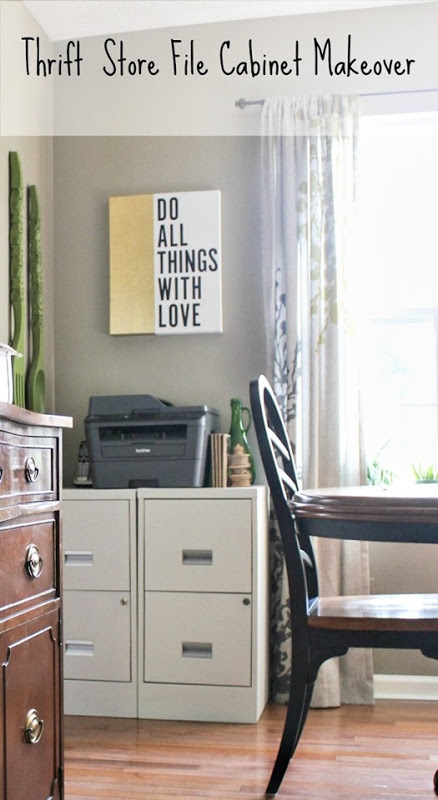 Space Planners recently posted…A PLACE FOR EVERYTHING, EVERYTHING IN ITS PLACE! Good job! Looks amazing! 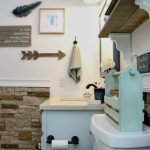 Keep sharing your DIY ideas. The results are impressive! What paint did you use? 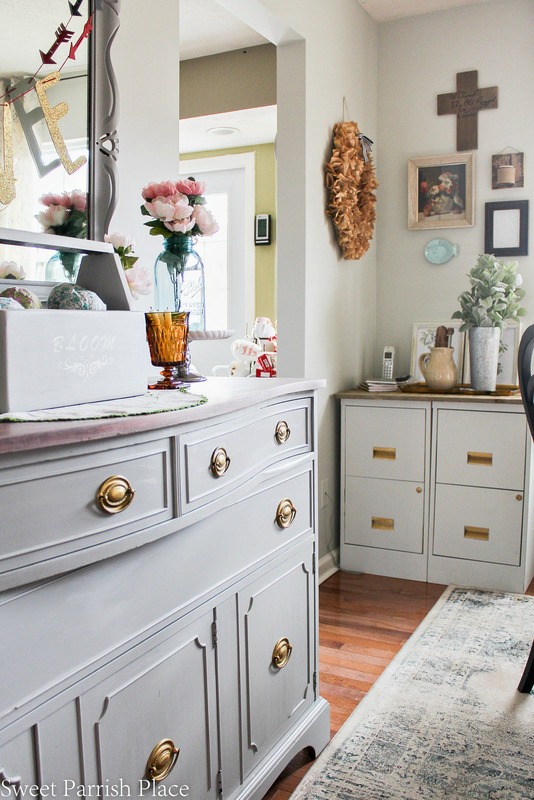 I used Gray Owl by Benjamin Moore. It was left over from me painted the living room walls. I painted them using a paint sprayer. Thanks so much!